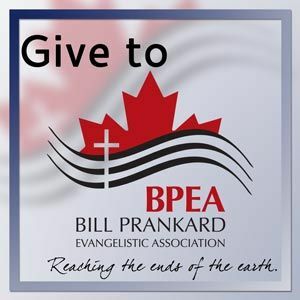 Give a financial gift to the Bill Prankard Evangelical Association. Canada was founded on the vision of a nation in which "He (God) shall have dominion from sea to sea and from the river to the ends of the earth" (Psalm 72:8), a verse which the Bill Prankard Evangelistic Association takes as its mandate. Over the years our country has drifted from His purposes, and has become a nation desperately in need of restoration and renewal of the vision. We believe that the declaration of the Gospel of Jesus Christ, "in demonstration of the Spirit and of power" (1Cor. 2:4), must include Canada's aboriginal peoples as well as the forgotten people in Russia's Arctic, "the ends of the earth." For more information on BPEA, visit our website at www.bpea.com.